Iceland is by far one of the coolest places we have ever been and probably will ever go. We have so much to say - let's dive right in! 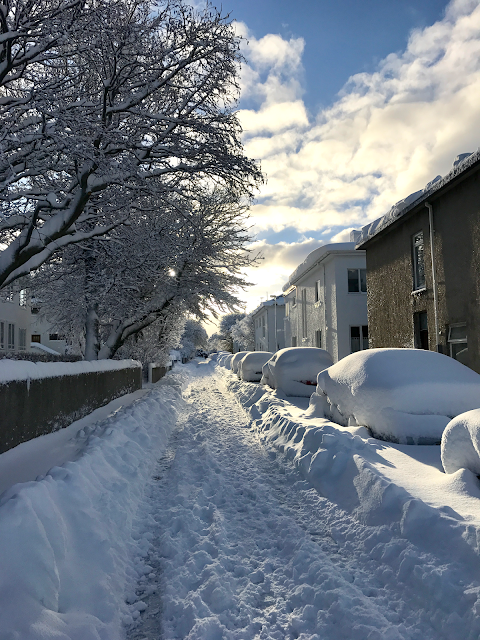 We arrived in Iceland late on a Thursday afternoon, the day after the first big snow storm of the season came through. 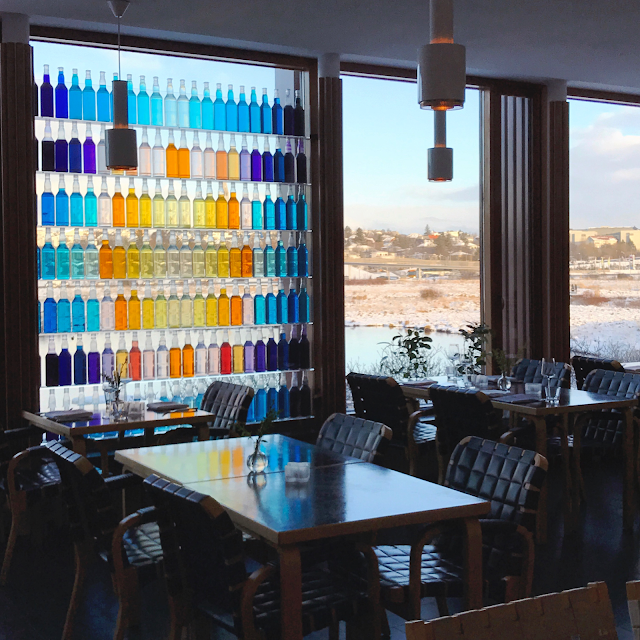 International flights fly into Keflavik Airport, which is about 45 minutes from Reykjavik. Once we landed and picked up our bag, we hopped on the FlyBus to Reykjavik. The drive from the airport to the city is actually really cool - all along the highway are fields of black lava rock. It's awesome to see. Once we arrived at the bus station, we walked to the Radisson Blu Saga to check in. You can read all about our time there in Monday's post but long story short - it was amazing. We had a Northern Lights tour reserved for later that night so we only had a couple hours to find dinner before our tour left. We walked to the nearby Aalto Bistro, which was interesting - not the type of place we'd typically find ourselves eating. When we heard "bistro" we thought quick and easy sandwiches or something... what we got was a gourmet dining experience. We were seated by an older gentleman with big glasses and an Icelandic sweater. Nick immediately realized that the shelves along the walls were filled with magazines and cookbooks with this man on the cover. Turns out he's a renowned chef. We ordered the "pumpkin burger" which was good, but it was actually a salad. All in all, just a unique experience. This place was pretty fancy and nice (read: expensive) and we were just a couple of hungry American kids trying to get a cheap sandwich that were caught off guard. Oh well! Finally we headed back to the hotel, got bundled up, and were ready to see some Northern Lights! Our tour bus took us about 45 minutes away from the city where there's no light pollution. 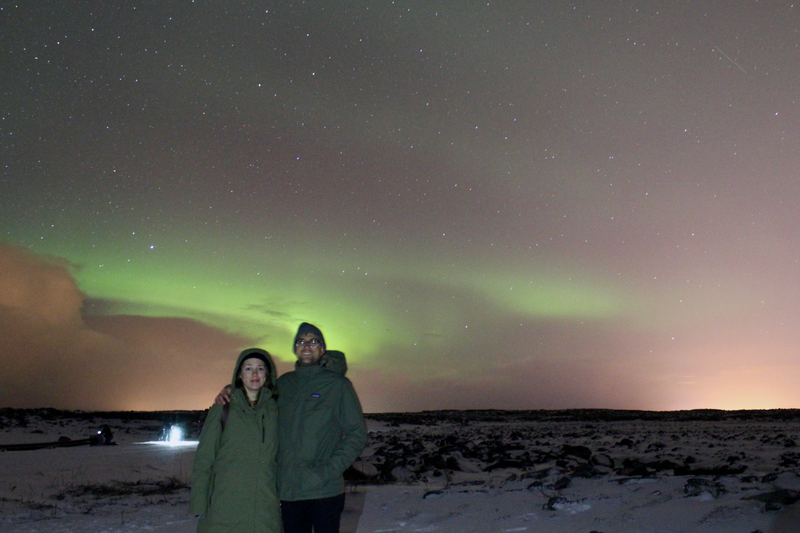 The Northern Lights are caused by interaction between particles from the sun and the atmosphere near the North Pole, so they're not visible everyday, but our tour guide thought the day's conditions were promising. Of course, weather plays a factor too, so when it started to rain on the drive, it was a little disheartening. Luckily we had a pretty great tour guide to tell us all about Icelandic elves and trolls, which she legit believed in. I think I'm a believer now too. Finally we arrived at the destination and there was a bit of cloud coverage. 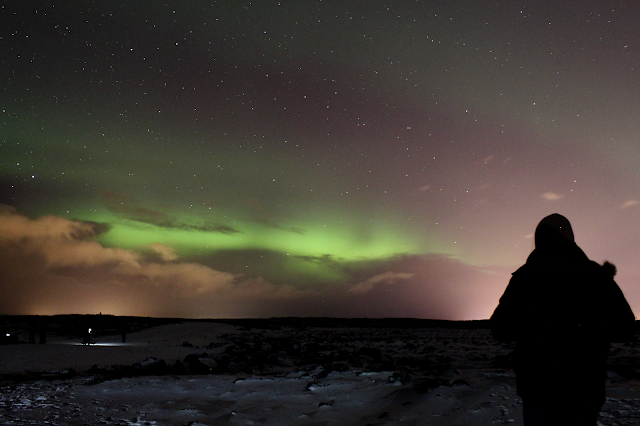 Once our eyes adjusted to the darkness and the clouds moved, there they were - the Northern Lights. This was so special. It's just one of those things I never thought I would get to see, but I did. They're not nearly as bright in person as they are in photos, but they're still there. A note about photos: you cannot get a photo of the Northern Lights unless you're using a camera that can take extended exposures. Your phone won't work unless you have an extended exposure app, and even then it probably won't be great unless you also have a tripod. We used our DSLR and tripod and to be honest, it still wasn't easy to capture photos. In the pitch blackness, auto-focus on the camera doesn't work so you have focus manually, very slightly adjusting it and taking test shot after test shot until the sky looks clear. Each exposure is about 20-30 seconds, so it can take awhile to get your camera focused. If we didn't have the tiny bit of photography knowledge we have from running this blog, I think we'd be lost. Many tourists showed up with only their phones and I can only imagine how disappointing it would be to go on a Northern Lights tour and not have any photos to commemorate the moment. I will cherish these slightly blurry photos and remember how absolutely difficult and frigid cold it was to get them. All in all, we highly recommend this tour. 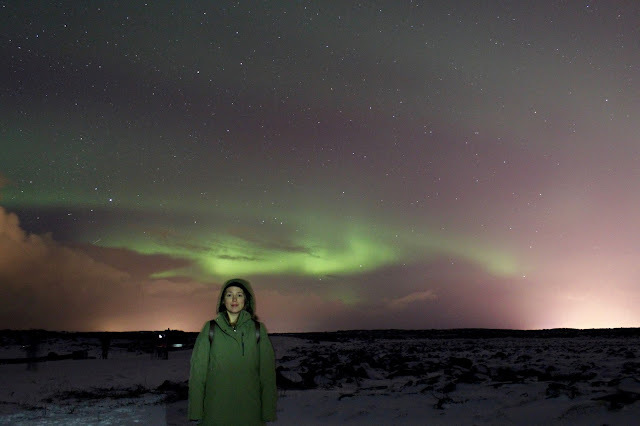 It was my absolute favorite thing we did in Iceland. If you don't see the lights on your tour, you can go again the next night free of charge. So do it, and take a good camera! After the Northern Lights tour, it was back to the hotel for the evening. By this point, the "pumpkin burger" we had eaten earlier had left us pretty much famished. Seeing as our hotel wasn't really within walking distance to too many places and we were now in the midst of a pretty crazy snow storm, we resorted to some good old fashioned Dominos pizza and beers from the 10-11 (yes, seriously, the convenience stores are called 10-11.) We're not exactly proud of getting Dominos on our European vacation, but without a car we needed food on foot, and this was pretty much our only option. AND, if we're being honest, the Dominos pizza in Iceland was closer to pizza shop pizza - the cheese was better, the crust more flavorful, it was some seriously delicious pizza. After wolfing down a few slices, drinking a few Icelandic beers, and taking the shower of an absolute lifetime, it was off to sleep in one of the most comfortable beds I've ever had the pleasure knowing. 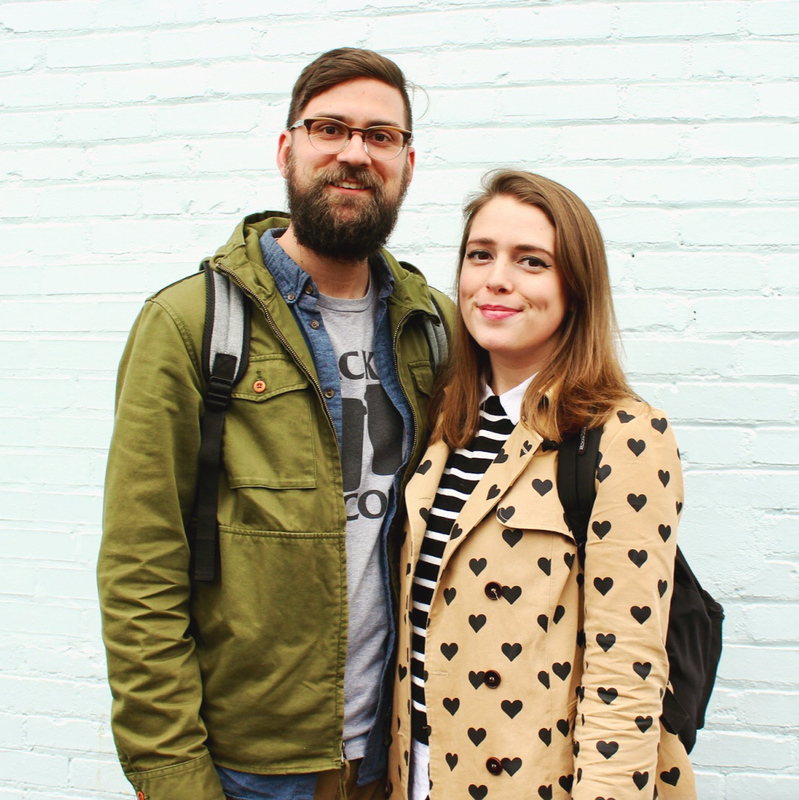 (Again, you can read more about our love for our hotel here.) 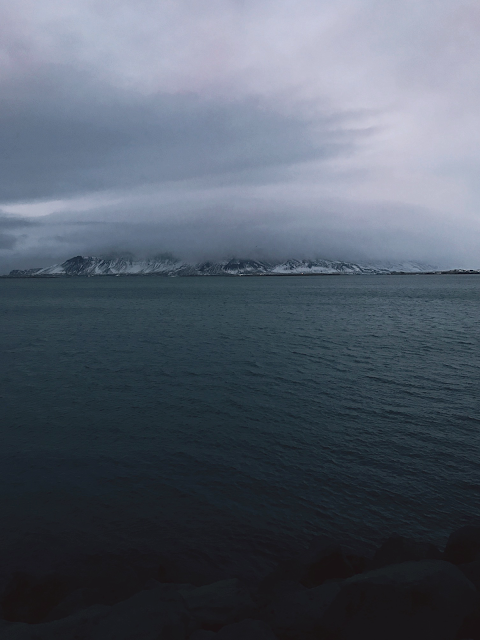 Goodnight day 1 in Iceland. We'll be back next week with the final post about our trip, but Nick is recapping final thoughts from day 1 below. - WOW Airlines: You've probably heard of WOW (they're the airline offering "$99 flights to Iceland.") I haven't read up on WOW very much, so we're just sharing our honest opinion. They offer inexpensive flights to/from Europe with the option to "stopover" in Iceland. 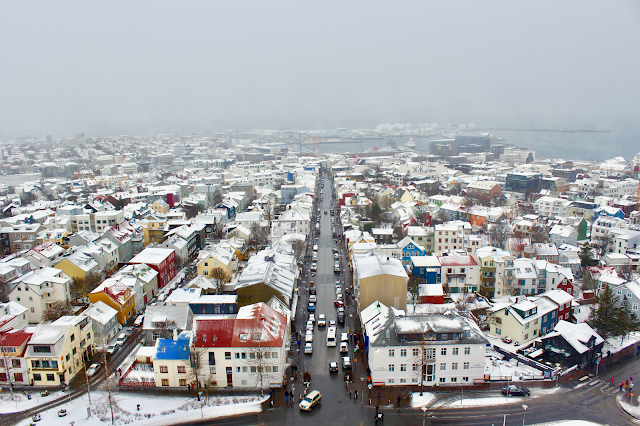 We essentially booked roundtrip flights to/from Baltimore/London with a 3 day stopover in Iceland. The "$99 flight" cost is really just the base-rate. Then you tack on your seat cost, bags, taxes, and other fees and it's no longer $99, but it's still CHEAP. There's no bells and whistles on the flight itself (no free food or drink) and it's not the most comfortable seat in the world for 6+ hours of flying, but in our opinion it was SO worth it because we like to spend as little money as possible, ha. Our total cost for flights was about $850, roundtrip, for BOTH of us. Worth. It. - Reykjavik Excursions: This is an affiliate company to WOW Airlines that we used to book our FlyBus tickets to/from the airport, as well as our Northern Lights tour. You can book right through the WOW website or the RE website. We purchased the basic FlyBus tickets which just took us to/from the airport and the bus station, but you can instead get FlyBus+ tickets, which will take you to/from the airport and your hotel. For our Northern Lights tour, they sent a van to pick us up at the hotel and took us to the bus station where we boarded a tour bus from there. On the way home, the tour bus dropped us off directly at the hotel, which was super convenient. I think there are several tour companies in Reykjavik, but we had great experiences with Reykjavik Excursions. - Walking: Just a heads up if you're planning to visit Iceland in winter time: they don't plow, salt, or shovel the sidewalks. Underneath main streets (keyword: MAIN streets) they do pipe hot wastewater, which melts the snow and ice. So in the city center (where a lot of the shops and restaurants are) the streets are pretty clean, but outside of that be prepared for some difficult treks. People walk in the middle of the street to follow the freshest tire tracks because its easier than walking on the sidewalk. 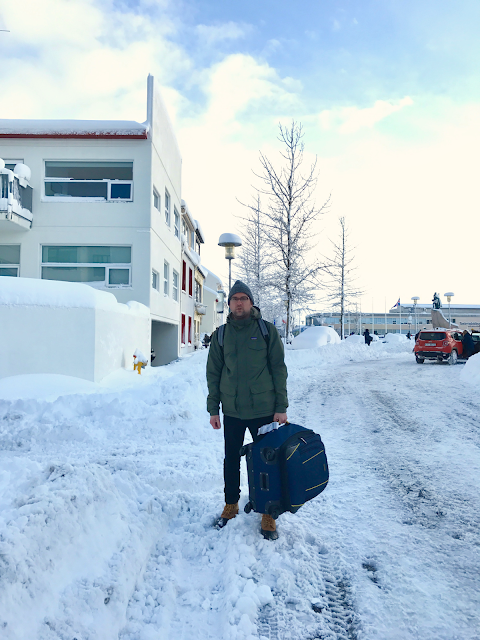 But if you're lugging around a 40 pound suitcase to and from the bus station on foot (which I was) it tends to make your journeys even more difficult. - Aalto Bistro: This very tiny, very pretty restaurant is in a shared office space (along with a CrossFit gym and I think a dentist's office?) But it is pretty fancy. The food, though delicious, was a bit further up the price scale than we were interested in paying. Headed by what seems to be an at least moderately famous chef, the restaurant serves gourmet, seasonal food. Just don't go in craving a hearty veggie burger. - Dominos: Yes, I'm seriously about to review Dominos on the blog. The Dominos in Iceland was GOOD. Nowhere on this pie could you find that weird, mushy, flavorless cheese that we see on our Dominos here, no! In Iceland, the cheese is a blend of sharp and mild cheeses, and the sauce (if there even was any) didn't flood the pizza with a sweet swamp of flavors no one even asked for in the first place. Admittedly, I'm not a fan of Dominos. But in Iceland? Yes. I'm a fan of Icelandic Dominos. It was also easily our cheapest meal on the entire trip. - 10-11: Iceland's 7-11. Good for snacks and beers. - Northern Lights Tour: You essentially HAVE to do this. 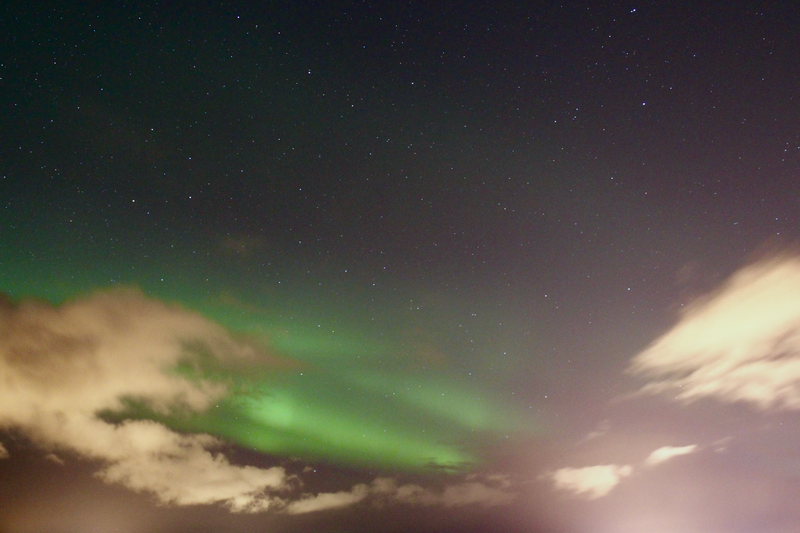 I mean, you're in Iceland, go see the Northern Lights! As Sarah mentioned earlier, book in advance, have a tripod, and a DSLR camera on which you can control the shutter speed. We recommend booking it for your first night. That way, if you don't see them, you have more opportunities to go back out for free! If you book on your last night and it happens to be cloudy (which is often likely) you're screwed. Book early and be prepared! It's magical. - Radisson Blu Saga Hotel: Just yes. Read the full post here! 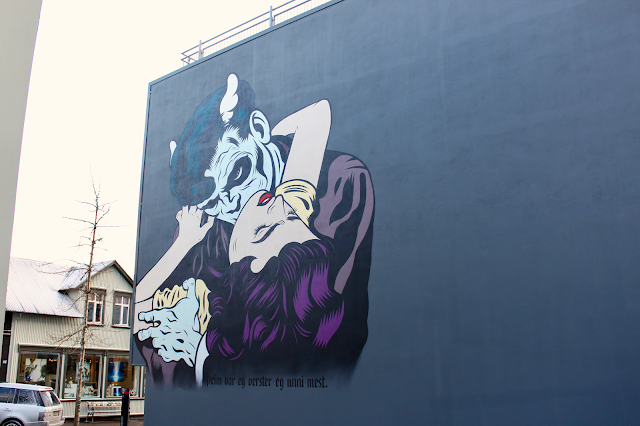 Next time, on the blog: Reykjavik, Iceland (Part 2). Be sure to check back in a couple of days to see what the rest of the trip had in store for us. Thanks so much for reading! LOOOOVED everything about this trip! It's definitely on my list of places to visit. We are actually heading to London in May and I saw that you went there too!! Thanks so much, Ashley! Have you been to London before? I seriously loved it there - can't wait to go back! So gorgeous! I love that you gave Dominoes a review (obviously it was worth it!). - Dominos: Yes, I'm seriously about to review Dominos on the blog. just when i think...whats nick going to say next that will kill me of laughter, he delivers! the best!!! and i think its cool that you mentioned the whole camera thing because i would have never know. from the looks of pictures, it seems like they would be easy to grab on a phone!! if i ever go, im definitely hiring you guys to book all my stuff! If you go you better take us with you! The northern lights look amazing! What an awesome experience! I hope to be able to see them one day. Now I know I'll have to practice with my camera first! Thanks, Tori! Definitely an amazing experience - hope you can see them someday too! This is such an awesome post because I'm definitely going to Iceland once we get WOW. I'm going to have to hang out with you guys and hear EVERYTHING.